Group video calling on your mobile will be available worldwide by the end of March. Group video calling on our smartphones isn't a new idea, but Skype -- arguably the most well-known name in video calls -- hasn't supported it, until now. 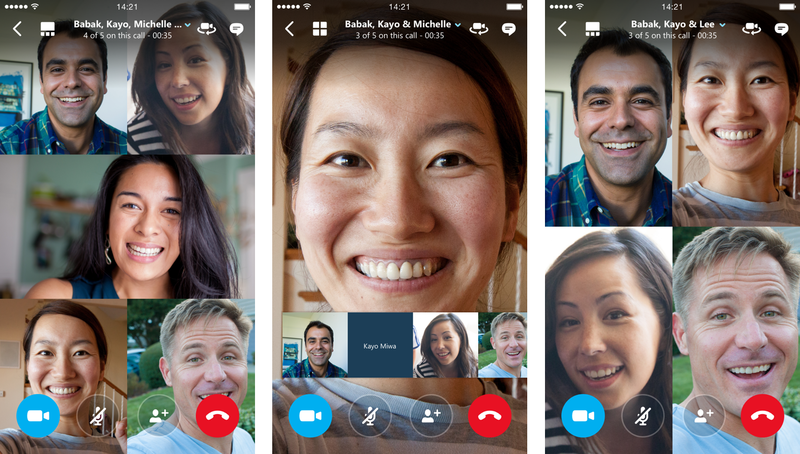 Today, Microsoft announced that group video calling will start rolling out in the Skype iOS and Android apps. For starters, the capability is going to be available to Skype users in North American and western Europe, but full worldwide availability is planned for the end of the month. At a high level, Skype's mobile video calling feature supports up to 25 participants, broadcasts at 1080p and lets you flip between the front and back camera at will. Supporting that many video callers meant Skype's video chat team had to think long and hard about the UI on such a small screen, and by and large it looks like they were successful. A view of what you're broadcasting is always pinned to the lower right hand corner of your screen, and as more and more people are added, the call's grid view dynamically adjusts to show you as many participants as it can. But once you hit more than seven participants, the display re-arranges things to highlight the person speaking by default, with all the other participants lined up at the bottom of the screen. You can then swipe through that lineup and find an individual caller and "pin" them to the screen so you always see what they see rather than let Skype pick your view. The new app also makes it a lot easier to invite people to your group who you might not already have as a Skype contact. Using the default sharing tools found in iOS and Android, you can send someone a message on your platform of choice asking them to join the Skype call. For example, you could share a link with someone over iMessage and when the recipient clicks it, they're automatically added to the Skype group video call without the need to actually add them to your contacts list. How often you'll need to initiate or join video calls with many participants while on your phone remains to be seen, but even if it's an infrequently-used feature, making the Skype mobile apps as fully-featured as the desktop version certainly makes sense. One question we do have is whether or not these features are also available on the Windows 10 Mobile version of Skype -- we've reached out to Microsoft to find out and will update this post with any details we find.